ONCE A RUNNER, ALWAYS A RUNNER? so habit-forming psychologically, that it takes willpower for me not to run . . . I am kept alive by movement. When I am immobile, I risk all that I am. If you love to run, you know exactly what Sheehan is talking about. If you're a passionate runner who's had to stop running against your will, you also know exactly what he's talking about. And you wonder what can ever take its place in your life. 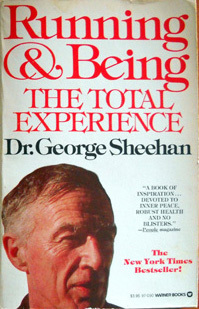 Thirty-two years ago Dr. George Sheehan wrote one of the most popular running books ever penned, the one quoted above. Coincidentally, it's the same year John Parker wrote his first novel, Once a Runner. I began running two years later. Both books became virtual cult classics in the sport and are still widely read. They aren't the reason I started running, but they were inspiring to read after I began running. They helped me understand why I'd fallen so helplessly in love with running, and so quickly. The title of this entry and the quotes sprinkled throughout it pay tribute to these runner-authors -- both of whom made an impact on me as a beginning runner and both of whom I have met in person: Sheehan at Grandma's Marathon in the mid-1980s, Parker at several of Roy Benson's running camps in the late 1980s and early 1990s. That's one of the very cool things about the sport of running: it is usually pretty easy to meet even the most renowned or elite runners and to feel at ease with them almost immediately because of the shared interest you have. It's even easier in the smaller world of ultra running, where egos aren't nearly as big as you'd think. Successful, well-known ultra runners like Scott Jurek, for example, join the gang for trail work, hang around the finish after races to encourage slower runners, and volunteer at aid stations. 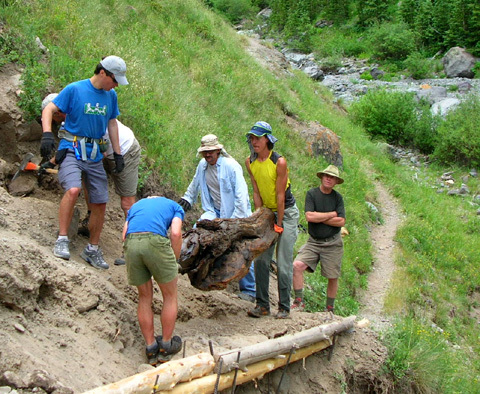 Scott Jurek (yellow shirt) helps haul a heavy log on a pre-race trail work day at Hardrock (7-5-07). He not only won the race that year, he also set a new course record in that direction! You'll seldom see that in most other sports. Sheehan's series of books speak more to running as a lifestyle than Once a Runner does but I know Parker remained involved with running throughout his adult life, not just in college. I wouldn't be surprised to learn that he's the one who came up with the popular slogan, "Once a runner, always a runner." Or was that some dude at Nike?? 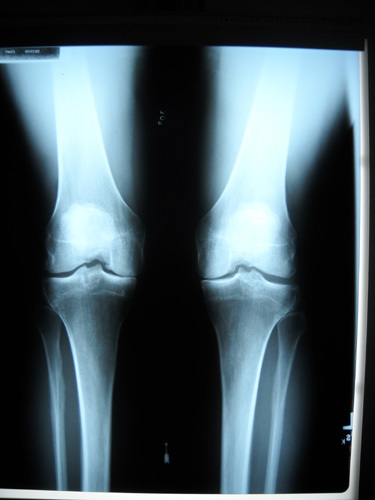 I've been writing this journal entry in my head for the past 28 months, ever since I found out that the cartilage was almost gone in both of my knees and I could foresee the end of what I fondly refer to as my running "career." I kept scribbled notes with this entry in mind; they morphed as my attitude changed over time but I'm still able to use many of them now. I finally put fingers to keyboard and dated a journal entry November 30, 2009 with the "Once a Runner, Always a Runner" title. It was filled with the range of emotions I was feeling about not being able to run any more. I wrote it a couple months after an even louder clarion call from my orthopedist: "You're bone-on-bone in both knees now, Kiddo." He didn't say "Kiddo," of course. That was my alter-ego, the one who wistfully thinks I'm still 35, not 60 (almost 61). Even though I had much of that entry written in late November, I wasn't able to force myself to finish it and make it public. Now I'm glad I waited because my head is in a completely different "place" than it was in November. I really don't know how I made the leap to acceptance of my new reality but I'm glad I did, without any more time lost in denial, self-pity, and sadness at my loss. "The first half hour of my run is for my body. The last half hour, for my soul. In the beginning the road is a miracle of solitude and escape. In the end it is a miracle of discovery and joy." This entry will be an attempt to describe to you the sadness that fills my heart every time I realize that my running days are coming to an end much sooner than I ever expected they would. To explain to a non-runner the joy I feel when I run is like describing colors to a person who has been blind from birth. at the end of our AT Adventure Run in 2005. As you can see, I'm still stuck somewhere in those stages of grief (loss) I wrote about two years ago: shock/paralysis, denial, anger, bargaining, depression, testing, acceptance. I wish I could report that I've reached the acceptance phase by now, but I seem to vacillate from day to day and week to week among the various stages before it. I'm nowhere near acceptance yet. now a symbol of my broken dreams? As usual, I'll try to not be too maudlin about it and even inject some humor into this essay. That's my nature; I'm essentially an optimist who doesn't stay depressed for long. If I leave no other legacy, that's perhaps the main thing I'd like for people to remember about me, along the lines of David Horton's optimistic reminder to ultra runners that it "never always gets worse." If you think things will get better in your life, they usually will. However, a few days before the Run to the Future (the Across the Years "substitute" race) in late December I came to a sudden, astonishing insight: it sure is nice to not have any more pressure to train for races! You have to understand how long and how deeply I've been addicted to running and racing to fully comprehend what that means. I was shocked to realize that I've not only reached the acceptance phase in my grief over the loss of the passion that has most defined and consumed me for the last thirty years -- one-half of my life -- but I now consider it a relief to no longer have to perform to the impossible running standards I've often set for myself. It's downright liberating! Maybe now I can finally become the Type B personality I've been striving to become the past ten years since I retired from my high-stress career (the one that paid for my running, not the running "career!"). This remarkable change in my attitude is largely a reflection of how frustrating running and racing have become in the last two decades as I've gotten older and slower with each passing year, unable to beat the time limits in ultra-distance races I used to be able to complete with comparative ease and getting further and further from my PRs at any distance. 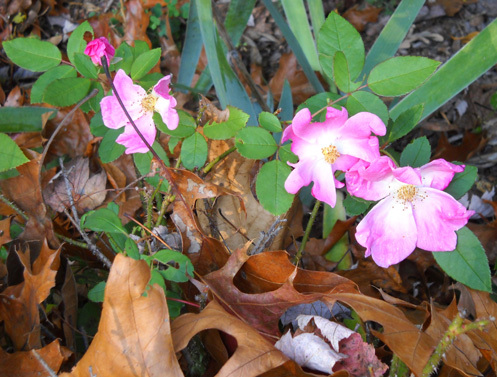 Tenacity: roses blooming in November, even as oak leaves fell from their branches. Seems like a good analogy to my running the last few years. But I was tenacious, not wanting to give up. Never mind that I was in my 30s and early 40s when I set those PRs! If some other runners could improve in their 50s and 60s, why not me?? I really enjoyed road racing . . . until all my times got slower instead of faster. I really enjoyed trail ultras . . . until I slowed even further and could no longer beat the time cut-offs in many of the races I loved to run. I could do the distances, just not in the times allowed. That's what I'm talkin' about: too much self-pressure to succeed and frustration when I didn't meet my own standards. 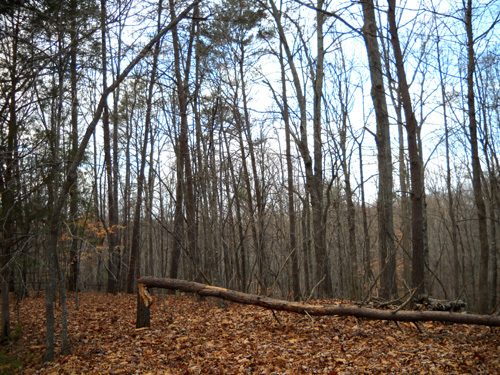 The joy of running was slipping away long before my knees betrayed me. found my body and the soul that went with it." I ran my first race in 1982, two years after I started running. It was the Avon Women's 10K in Atlanta, and I was thrilled to finish in the middle of the pack. I'd been running for over two years before I entered that race. I worked up to several comfortable 10-mile training runs first, fearing that I'd "come in last" if I wasn't over-trained for the 6.2-mile distance. Can you say, Over-Achiever? Typical Type A. Pressure from the very beginning. 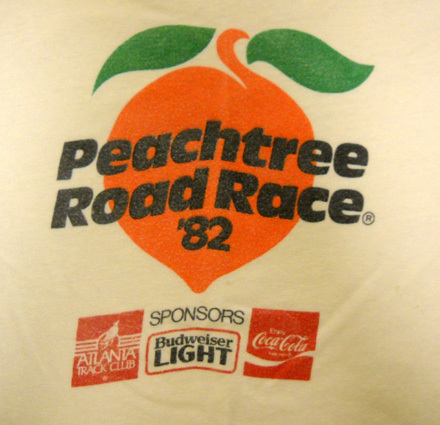 Shirt from my second race: July 4, 1982. For too many years after that, it was hard for me to just run for the pleasure of running. The biggest regret I have about my running (well, besides having to stop now!) is that I was too darn competitive with myself and others for too much of the time. Running was too often a means to an end (i.e., good racing) and not a journey in itself. 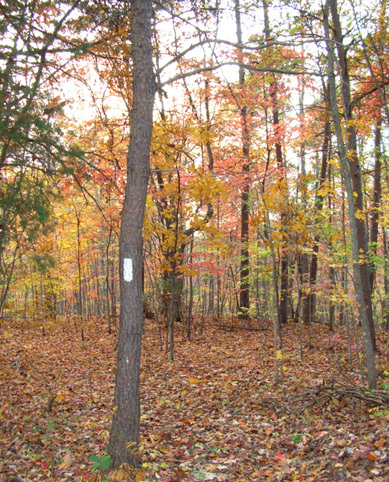 Oh, I've always loved being out in the woods on trails, putzing along and thoroughly enjoying my surroundings. But I sometimes felt "guilty" if I wasn't focused on training methodically for my next race -- doing hill work, speed work, long runs. Running was too often more like work than fun. But I enjoyed the challenge and camaraderie of races too much to give them up, although I did fewer each year as I got older. 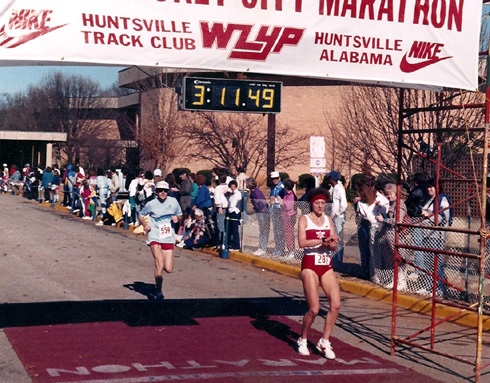 Training for the 1987 Rocket City Marathon was definitely work! I was disappointed I didn't better my 3:05 PR, set earlier that year at Shamrock. With a race always coming up -- even if it was "just a training run" for a more important goal race later on -- I put pressure on myself to perform as well as I could. It's how I'm wired. That meant pushing myself on most training runs. Work, not play. Only in recent years, since our Appalachian Trail Adventure Run in 2005, have I really begun to enjoy the running journey more than the end result. What's sad is that it took me so long to revel in that journey . 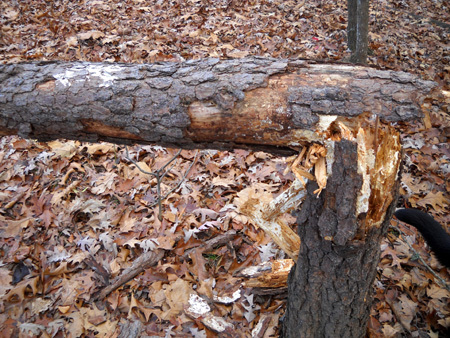 . . and then the trip got cut short. Similar to the various stages of life we all experience, I've been through several phases in my running "career:"
from walking and hiking for pleasure my first 30 years . . .
to running to lose weight and get fit . . .
to road racing for PRs from track events to the marathon distance . . .
to challenging myself by running farther and farther distances, up to 100 miles . . .
to finding satisfaction in slower journey runs and fixed-time races . 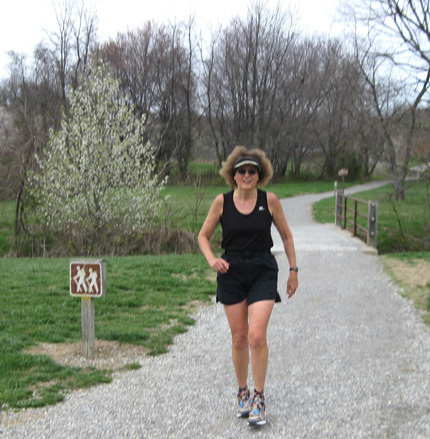 . .
to finally facing reality, accepting the fact that running will only hasten my need for knee replacements, and finding joy in simply walking and hiking again. For me, that's a huge sea-change. The good news is that I'm happy with that right now -- as long as I can walk long enough to still produce some feel-good endorphins! Fortunately, the endorphins usually kick in after about 45 minutes. I'm still "addicted" to aerobic exercise in that regard.